It's not uncommon to pick up the phone, dial a help hotline, and receive either a busy signal or the message that you're going to be waiting for “15 minutes or longer.” That's from the consumer side, and one can only imagine how the person on the other end of the phone feels by the end of the day. FAQ should solve this problem through providing customers with the ability to answer their own questions without requiring direct contact. Think about it this way. When a consumer logs onto your website, he or she is similar to a customer walking into a store. Only in this virtual world, there is no employee who can offer to help them find whatever they need. An FAQ page serves as a virtual employee who consistently and accurately provides assistance. In effect, well-written FAQ pages illustrate that your company understands the meaning of customer service and strives to obtain excellence. 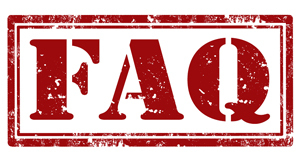 FAQ stands for Frequently Asked Questions. All of these questions should stem from the most common issues raised by users, often deriving from questions consumers are asking on a daily basis. A well-written FAQ page can ease the heavy burden known as “customer support” by making the answers to commonly asked questions readily available. When writing FAQ, it’s imperative that you think like your audience. Put yourself in their shoes for a second and really take a moment to think about what questions they would likely have and what answers would be most helpful. Make your questions and answers as conversational and engaging as you can. People already jump to the conclusion that FAQ are boring. Creating dialogue or adding humor can dramatically increase the traffic you have on this webpage, and it might actually decrease the calls you would have received otherwise. Watch out for grammar and spelling errors; it is surprisingly easy to appear sloppy and uneducated. Less is more-keep your questions and answers as concise as possible. Accuracy is crucial; it helps no one if you’re providing incorrect information. If anything, you’ll lose customers out of frustration. Layout and organization matter. Make sure you consider how you’re organizing the questions. Easier questions should go at the top, and answers should directly follow each question. Linking the answers to your questions is another option, as it improves readability. Create a table of contents. This allows consumers to quickly scan all of the possible topics and select the most appropriate section. Contrary to popular belief, a bit of white space on the page actually makes it easier to read what you’ve written. Use an active voice rather than the passive voice to ensure clarity and sound more confident. Update consistently. FAQ should change often in order to keep up with your consumer’s needs. Maintain a frequent communication with your support staff. They are interacting with customers on a daily basis, and they will be able to provide you with questions and issues they are encountering daily. Be a visual thinker. In today’s world of constant social media updates, ads, billboards, etc., we are surrounded by more images and less text. Fewer people have the time or energy to read a novel, and they aren’t going to do it. Incorporating pictures, diagrams, and other interesting visuals will improve your FAQ page dramatically. Videos are also an option and can be especially useful in demonstrating a specific task. Avoid marketing. This is not the time to focus on branding or company promotion. You have your entire website (and hopefully social media platforms) working on that component daily. Keep this focused and question-specific. Disclaimers are always good to include. It never hurts to mention that while you believe the information is accurate, you cannot be held responsible for it. You can also copyright your FAQ, so others cannot use the information without your consent. Provide an opportunity for comments and critique. By allowing readers to rate and comment on the accuracy/helpfulness of your FAQ page, you receive direct feedback from the very people who matter the most. Contact information should be also be included somewhere on this page with your telephone number and/or email address so customers can easily access you if their questions aren’t answered. In essence, FAQ are extremely valuable tools for business owners. They provide immediate access to information and instructions without forcing customers to wait endlessly on the phone or for a response via email. Bottom line: A well-written FAQ page helps customers receive service (and will likely lead to a purchase) without even requiring a salesperson’s presence. Just the FAQ please.